Weave a Picnic Basket for summer! 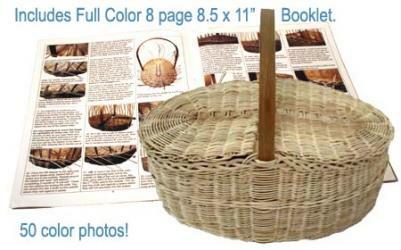 We have a super basket weaving kit to make a traditional wicker picnic basket suitable for handing down through the family. You’re going to love weaving it as much as we enjoyed designing it! 51 full color illustrations and photos demonstrate every step of the way. 8 pages (8.5 x 11″) of instruction. 12×21″, 8″ deep, 14″ tall including handle. Remember to Like Us on Facebook and get a Coupon Code that you can use Today!